(4ed) 10.1 The turntable of a record player rotates at a rate of 33 1/3 rev/min (rpm) and takes 60.0 s to come to rest when switched off. and (b) the number of revolutions it makes before coming to rest. (4ed) 10.2 A car is traveling at 36 km/h on a straight road. The radius of the tires is 25 cm (0.25 m). Find the angular speed of one of the tires with its axle taken as the axis of rotation. (4ed) 10.3 A can of soup has a mass of 215 g, height 10.8 cm, and diameter of 6.38 cm. It is placed at rest on the top of an inclined that is 3.00 m long and at 25o to the horizontal. Using energy methods, calculate the moment of inertia of the can if it takes 1.50 s to reach the bottom of the incline. (4ed) 10.4 A flywheel in the shape of a solid cylinder of radius R = 0.60 m and mass M = 15 kg can be brought to an angular speed of 12 rad/s in 0.60 s by a motor exerting a constant torque. After the motor is turned off, the flywheel makes 20 rev before coming to rest because of friction (assumed constant during rotation). What percentage of the power generated by the motor is used to overcome friction? Q10.4 A turntable rotates at a constant rate of 45 rev/min (rpm). What is its angular speed in radians per second? What is the magnitude of its angular acceleration? Q10.7 Suppose that only two external forces act on a rigid body and the two forces are equal in magnitude but opposite in direction. Under what condition does the body rotate? The two forces will provide a net torque, causing rotation, unless the two forces lie along the same line. Q10.9 Using the results from Example 10.12, how would you calculate the angular speed of the wheel and the linear speed of the suspended mass at t = 2 s, if the system is released from rest at t = 0? Is the expression v = R valid in this situation? Yes, v = R is still valid. At the top of p 311, we have an expression for either the linear acceleration or the angular acceleration. We can use either one of those to find the linear velocity v or the angular velocity and then use v = R to find the other. Q10.11 Explain why changing the axis of rotation of an object changes its moment of inertia. Changing the axis of rotation changes lots of things. In particular, it changes -- or may change -- the distance through which some of the mass moves. Consider a meter stick rotated first about its center of mass and then about its end. When the meter stick is rotated about its center of mass, both halves of the meter stick move in a circle with a maximum radius of 0.50 m.
When the meter stick is rotated about its end, one half of the meter stick still moves in this same circle. But the other half of the meter stick moves in a circle with a minimum radius of 0.50 m and a maximum radius of 1.0 m. This half of the meter stick moves through a greater distance and at a greater linear speed. All this means it is more difficult to rotate. If it is more difficult to rotate then we describe this by saying it has a greater moment of inertia -- or a greater "rotational mass". Q10.14 Must an object be rotating to have a nonzero moment of inertia? No. Likewise an object has a nonzero mass even when it is sitting still. Q10.15 If you see an object rotating, is there necessarily a net torque acting on it? If there is a net torque acting on it, the object will have an angular acceleration. If you see an object moving, it does not necessarily have a net force acting on it. Q10.17 The polar diameter of Earth is slightly less than the equatorial diameter. How would the moment of inertia of Earth change if some mass from near the equator were removed and transferred to the polar regions to make Earth a perfect sphere? The mass that was at the equator that has been moved to the pole initially was far from the axis of rotation and is now very near the axis of rotation. That means the moment of inertia -- or the "rotational mass" -- of that mass is now less. That means the whole moment of inertia for Earth has decreased. Solutions to problems from the current, fifth edition. 10.8 The tub of a washer goes into its spin cycle, starting from rest and gainiing angular speed steadily for 8.0 s when it is turning at 5.0 rev/s. At this time the person doing the laundry opens the lid and a safety switch turns off the washer. The tub smoothly slows to rest in 12.0 s. Through how many revolutions does the tub turn whil it is in motion. Of course, we have two problems here -- how many revolutions are made as the tub speeds up and how many revolutions are made as the tub slows down? We will take each in turn. First, how many revolutions are made as the tub speeds up? We need the angular acceleration . Since there will be a different angular acceleration as the tub slows down, we will call this one 1. 10.20 A car traveling on a flat (unbanked) circular track accelerates uniformly from rest with a tangential acceleration of 1.70 m/s2. The car makes it one quarter of the way around the circle before skidding off the track. Determine the coefficient of static friction between car and track. The radius is not given so we will simply call it R and expect it to "drop out" of the answer. / 2 = 90o = one-fourth the way around the track. 10.24 The center of mass of a pitched baseball (radius = 3.8 cm) moves at 38 m/s. The ball spins about an axis through its center of mass and with an angular speed of 125 rad/s. Calculate the ratio of the rotational energy to the translational kinetic energy. Treat the ball as a uniform sphere. 10.28 Three identical rods of length L, mass m, and radius r are placed perpendicular to each other as shown in Figure P10.22. The setup is rotated about an axis that passes through the end of one rod and is parallel to another. Determine the moment of inertia of this arrangement. We will use the parallel-axis theorem or the basic definition of moment of inertia to find additional moments of inertia as we need them. Look at the individual rods and find the moment of inertia of each of them. Rod #1 is easy; it is just a rod rotating about its end. Rod #2 requires use of the parallel-axis theorem since it is being rotated about an axis parallel to an axis through its center of mass. The distance between those two axes is R = L/2. Be careful with rod #3. It is probably easier to handle if we change our perspective and look at its motion directly along the axis of rotation. This "rod" is also rotating along an axis parallel to an axis through its CM. But look closely at this parallel axis through its CM. 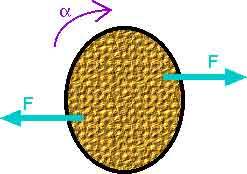 For rotation about this axis, this is the rotation of a "solid cylinder". This time, ICM = (1/2) M r2. The distance between the two axes is still R = L/2. (b) a solid sphere about an axis tangent to its surface. For rotation about the CM, , we know the moment of inertia. So we can use the parallel-axis theorem. The distance between the two axes is R.
(b) the tensions in the string. Now look at the torques on the pulley. This is not the usual "lightweight pulley" we have encountered before. You might think of this as a flywheel. It has a moment of inertia that is large enough that it can not be neglected. This also means the tension in the rope on one side of it will be different than the tension on the other side. Hence, we have labeled the tensions at T1 and T2. Now we are ready for the forces on m2, the mass on the incline. Now we have three equations with three unknowns, T1, T2, and a. Now we can put in numbers and then solve for the unknowns. 10.40 A potter's wheel, a thick stone disk of radius 0.50 m and mass 100 kg, is freely rotating at 50 rev/min. The potter can stop the wheel in 6.0 s by pressing a wet rag against the rim and exerting a radially inward force of 70 N. Find the effective coefficient of friction between wheel and wet rag. This angular acceleration is produced by a torque due to the friction force exerted by the potter with the wet rag. To evaluate this numerically, we need the numerical value of the moment of inertia for the potter's wheel. 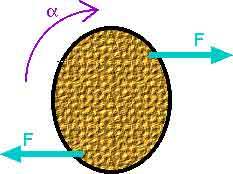 10.43 A 15-kg mass and a 10-kg mass are suspended by a pulley that has a radius of 10 cm and a mass of 3.0 kg (Fig P10.32). The cord has a negligible mass and causes the pulley to rotate without slipping. The pulley rotates without friction. The masses start from rest 3.0 m apart. 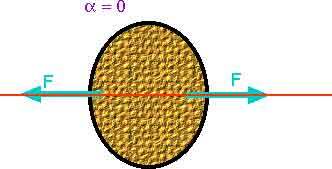 Treat the pulley as a uniform disk and detemine the speeds of the two masses as they pass each other. Now we have three equations -- from the three free-body diagrams -- and three unknowns. With this acceleration of 1.85 m/s2, how fast will the blocks be moving after they have moved a distance of 1.5 m? (4 ed) 10.3 A can of soup has a mass of 215 g, height 10.8 cm, and diameter of 6.38 cm. It is placed at rest on the top of an inclined that is 3.00 m long and at 25o to the horizontal. Using energy methods, calculate the moment of inertia of the can if it takes 1.50 s to reach the bottom of the incline. What is a "J s2"? and, of course, those are just the units we would expect for a moment of inertia. For confidence -- and for practice -- what would be the moment of inertia of this soup can if it were a solid cylider? And that is reasonably close to the value we calculated for our can of liquid soup. While friction brings it to a stop it has an angular acceleration due to friction. Remember, this is the angular acceleration due to the torque caused by friction. How is this related to power? Just as P = F v for the linear case, we can write P = for the rotational case. This is the power supplied by the motor. How much is absorbed by friction?